Long time no blog. I’m going to rectify that starting this week! What else, what else…Oh right! Last Thursday I defended my thesis. (For the final time). It went well and overall I’m still a bit bewildered at the thought of being able to put the PhD behind me. I’ve gotten so used to it being there and being not done, you know? So, there will be a bit of wrap-up before I hand it in and then I’d like to chill for a bit before getting back to more job applications and wrestling with publications. Catch ya again later on in the week! Congrats, Dr. Glenna! What a huge accomplishment. 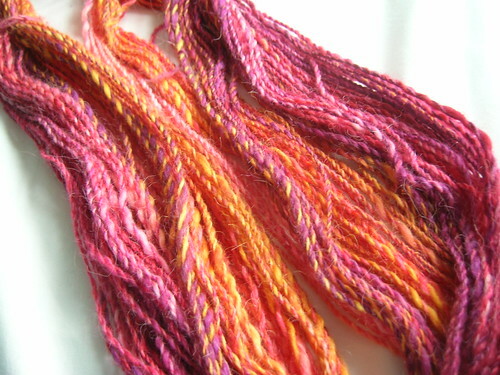 I like the handspun…and am increasingly tempted to learn to spin. You may just convince me to try! Awesome, Glenna with the Ph.D. Fantastic! Unfortunately, I cannot bring you a drink. However, I can give you my fav drink recipe; short, but oh so yummo: Take a regular sized tall drinking glass, fill with ice cubes, add as much of your favorite vodka as you like and finish it off with strawberry, bananna, orange juice (Twister brand if you have that there and drink it down. I love it. I call it Jungle Juice because of the bananna I guess. Enjoy and with that I send a bunch of well wishes! Congrats! That is very exciting news. I hope that you take some time to relax before facing the “real world”. Also, your handspun looks good enough to eat! Congratulations! After the final wrap up is done, take my advice and don’t look at the thesis again for at least 6 months! Otherwise, all you’ll see are the things you aren’t happy with, instead of seeing what a great accomplishment it is (I speak from experience here!) And the ply looks great – love the colors! Well, well, our esteemed Dr. Glenna! Congrats!!!!! Enjoy the yarn and drink! Congrats on finishing with your thesis! Buy some yarn to celebrate. Love the yarn, very pretty. Congratulations on the successful defense! Hurray for you. Congratulations, Glenna! That’s some good news! And I’m glad to hear you’re taking time to celebrate–with wine and yarn. You definitely deserve it! Also, it’s good to set the dissertation aside for a while, to give you a bit of perspective before beginning revisions. And your handspun does look lovely. I’ve got a several braids of fleece artist roving waiting to be spun. They’ve been waiting for a while now, alas! I love the colors in your yarn. Great – so now you can spin as well as I can on a spindle – will you leave me nothing woman? I so wish I could have drinkies with you but alas work calls. Can I have a raincheck? The yarn looks great! I love the colours. Congratulations!!! The yarn is so pretty, too. Congratulations! But I think “regular knitters” is an oxymoron! Your yarn looks great! I can’t get anything that even resembles yarn from a drop spindle. Your yarn looks lovely. I never managed to work a spindle properly. Congratulations!!! 😀 And the spinning is looking great. Anyway, enjoy the celebrations, they’re well deserved! I’ve congratulated many bloggers on knitting accomplishments but this is my first on a doctorate! Many congrats! Enjoy your well deserved celebration and I agree with Andrea in the comments – buy some yarn to commemorate the event! Congrats! I hope you enjoy your knitting and drinking celebrations! Your yarn is looking fab. I’ve just booked on a drop spindle workshop for the bank holiday weekend and I am so excited! Good for you, Glenna. 🙂 You take a well-deserved break – had I not been on another continent, I would totally supply you with drinkies. Like Malibu and coke. Mmm… It’s summer in a glass. Really. Hope you are relaxing with knits and sips! Congrats to you! Best wishes for a bright and successful future. You should be proud of your big accomplishment, once it finally sets in of course that it’s actually over. I am pleased to say that I will be in Canada within a couple hours, alas the French speaking part. I’ve been visiting my brother in Vermont this week and tonight we head north to Montreal. I am so excited. It’s my first trip to Canada. Congratulations Glenna! What a great accomplishment. So what are going to do now? Disneyland is only 30 minutes away from me. 😉 I wish I were in Toronto so that I could celebrate with you. Since I’m not, I’ll have a glass of wine tonight in your honor. Ooh! Heartiest congratulations on the PhD defense. Now it’s all about just dotting the final i’s and crossing a t or two, and you’ll be done with it FOREVER. Congratulations! Your spinning is looking very good & the colors gorgeous. Enjoy your celebrations. Congratulations, Glenna! How exciting! And what a relief if must be! Sorry I missed the party. It’ll take a bit for the haze to wear off (due to the mental exhaustion) so enjoy a bit of time to recharge your batteries and not be working on the diss.